Indirect immunofluorescence assay in asexual stages of the FCR3S1.2 clone. 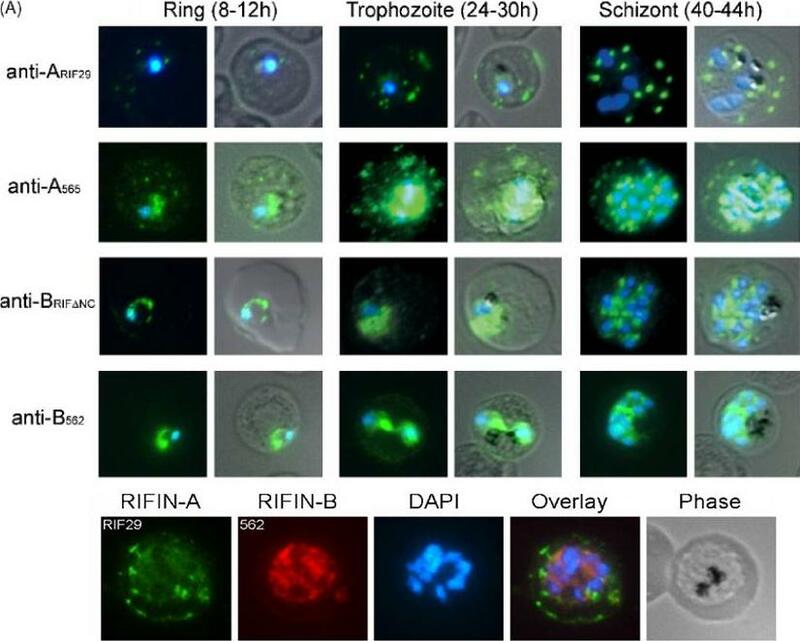 A-type RIFINs identified by rabbit anti-A565 and rat anti-ARIF29, were found to be associated with the parasite and transported to the surface of infected erythrocytes via Maurer’s clefts. B-type RIFINs, identified by rabbit anti-B562 and mouse anti-BRIFDNC appeared to be mostly retained inside the parasite.Lower panel: A- and B-type RIFINs are both expressed in the same IE as detected by anti-ARIF29 (green) and anti-B562 (red) antisera, respectivelyPetter M, Haeggström M, Khattab A, Fernandez V, Klinkert MQ, Wahlgren M. Variant proteins of the Plasmodium falciparum RIFIN family show distinct subcellular localization and developmental expression patterns. Mol Biochem Parasitol. 2007 156:51-61. Copyright Elsevier 2009.